Aboard Seabourn Odyssey, you’ll discover an ambiance that is relaxed and casual, elegant and unassuming with the distinctive silhouette and signature features of Seabourn. It is this privileged realm of travel that has been so carefully recreated aboard the next generation of Seabourn yachts - welcome to Seabourn Odyssey. Designed by Yran & Storbraaten, the world’s foremost architects of ultra-luxury ships, Seabourn Odyssey will accommodate 450-guests with the same personal feel and relaxed ambience of her sisters, Pride, Spirit and Legend. The intimate lounges with open-bar policy, the water sports Marina, all-suite accommodations - 90% with private verandas, a luxurious two-deck spa, numerous pools and outstanding choices in dining including menus by the renowned chef Charlie Palmer. But perhaps, best of all, her service ratio remains the highest at sea. 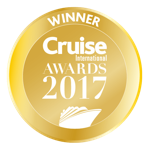 The five star dining experience aboard The Yachts of Seabourn has been recognized by the readers of Condé Nast Traveler as the best of any cruise line for two years running. And with Seabourn Odyssey, they're offering even more of what they do best with fresh new dining options like The Colonnade restaurant. The Restaurant - traditional dining and is open for breakfast, lunch and dinner with menus by celebrity chef Charlie Palmer. Restaurant 2 - an intimate, contemporary restaurant with innovative tasting menus and wine pairings. The Colonnade - an indoor/outdoor restaurant with an open kitchen, serving breakfast, lunch and themed dinners. Patio Grill - casual poolside patio dining for breakfast, lunch and dinner. In-suite service - always available from our 24-hour suite service menu or, during dinner hours, served course by course from The Restaurant menu. A worldly company travels aboard The Yachts of Seabourn. People whose lives are diverse and experiences are wide. The atmosphere is upscale but genuine, and socializing is one of the most interesting activities – especially when the sun goes down. Guests drift from suite to salon, dining room to showroom, casino to nightclub, enjoying an aperitif in the Observation Bar or swaying to a live band under the velvet canopy of a starry night sky at The Patio Bar. In the Grand Salon, there’s an ever-changing lineup of entertainment from shows and comedy acts to dancing with the Seabourn band. Or head on over to The Club where there may be a duo for dancing and a DJ later on to keep the beat going. Before turning in, take a turn out on deck or have a nightcap in the Sky Bar with its lofty view of the sea and the sky. A setting quite close to perfection. Within reach of the stars. Relish the ease of Seabourn yachting life aboard Seabourn Odyssey. Enjoy an environment where your preferences are noted, your options are virtually limitless and your spontaneity is indulged. Feed your mind with luminaries in the arts and world affairs that highlight our Dress Circle Series. Explore the culinary arts with a cooking demonstration by our own chefs. Discover what a mango has in common with a Chardonnay at a wine seminar hosted by our Sommelier. Relax and feel your troubles and tensions melt away in our signature two-deck shipboard spa. Seabourn Odyssey has one of the highest space ratios at sea. But it’s how she uses all this space that will make our loyal following feel right at home. Her six bars and lounges are designed on an intimate scale and our open-bar policy is conducive to all manner of socializing. The innovative Seabourn Square is the true heart of the ship, where you’ll find staff on hand to provide one-on-one service, with advice about shore excursions, or the best places to shop and the like. The spacious Patio Deck is the central outdoor living area with its stunning pool, shady cabanas and outdoor bar and grill. Everything on board first class was fabulous. Pleased to recommend Seaborne.